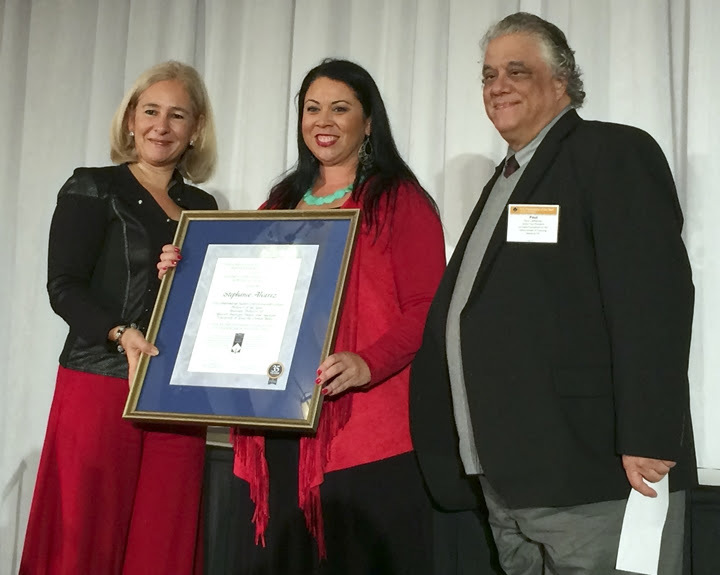 RIO GRANDE VALLEY, TEXAS – NOV. 19, 2015 – Dr. Stephanie Alvarez, an associate professor of Mexican American Studies at The University of Texas Rio Grande Valley, has been named a U.S. Professor of the Year by the Carnegie Foundation for the Advancement of Teaching and the Council for Advancement and Support of Education (CASE). Alvarez is the first faculty member in The University of Texas System to receive the national award, and is one of just four national recipients this year. Alvarez joined UTRGV’s legacy institution, UT Pan American, in 2006. Among her accomplishments are helping redesign the Mexican American studies program, and developing the Cosecha Voices project with the late Latino poet Tato Laviera. The project provided training to migrant students in the K-12 public school systems on creative writing assignments about their experiences working as migrant farmers with their families. Dr. Ala Qubbaj, UTRGV vice provost for Faculty Affairs and Diversity, said the recognition is well-deserved. Alvarez might draw inspiration from her students, but those students say she is their inspiration. Claudia Razo, another UTRGV graduate student in Mexican American Interdisciplinary Studies, said Alvarez has guided her throughout her undergraduate and graduate experience, from advising her on which courses to take, to encouraging her to continue her studies into the master’s program. “She was the one who inspired me to do it. I wanted to finish with my bachelor’s degree and that was it,” Razo said. “She said I could do it. She kept telling me to move forward and apply.” Razo took the advice to heart. “She’s become a huge part of my life, because she’s been such an inspiration to me,” she said. Conducted by CASE and sponsored by the Carnegie Foundation for the Advancement of Teaching, the national awards recognize professors for their influence on teaching and commitment to undergraduate students, according to a CASE news release. In addition to the four national winners, 35 faculty members were named state Professors of the Year. CASE began the awards program in 1981. National and state winners of the 2015 U.S. Professors of the Year awards were honored today, Nov. 19, 2015, at a luncheon and awards ceremony at the Ronald Reagan Building and International Trade Center in Washington, D.C.